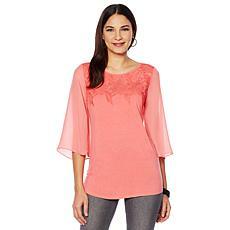 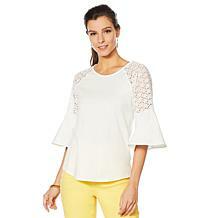 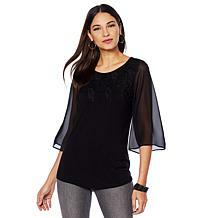 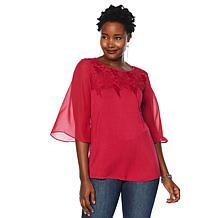 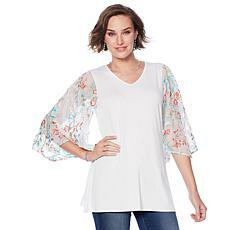 Flowy chiffon sleeves add a breezy element to this mixed-media top, while lace appliqué provides face-framing texture. 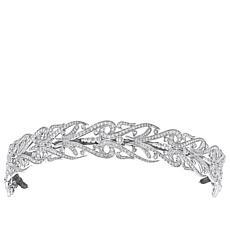 Look and feel oh-so pretty each time you wear it. 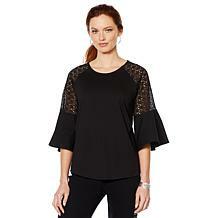 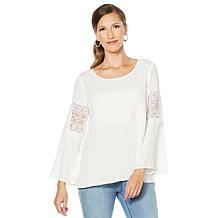 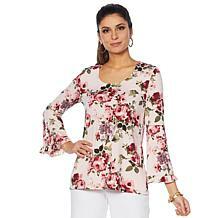 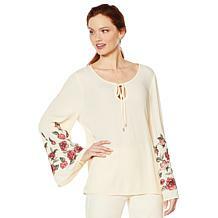 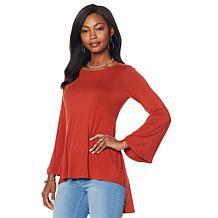 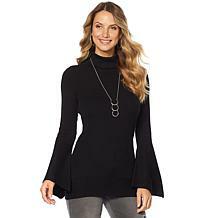 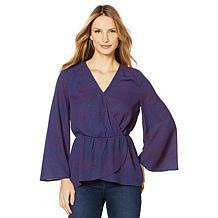 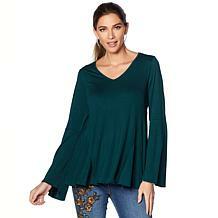 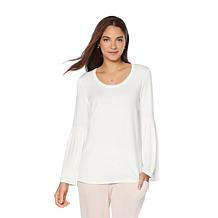 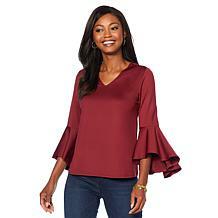 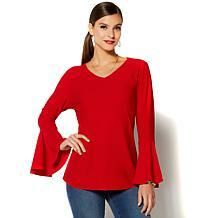 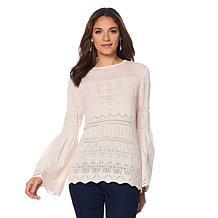 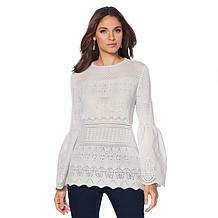 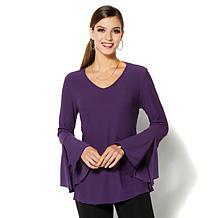 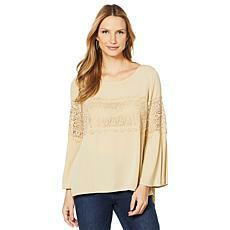 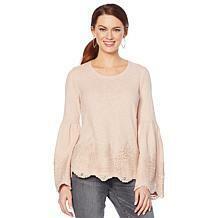 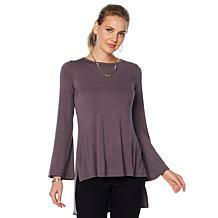 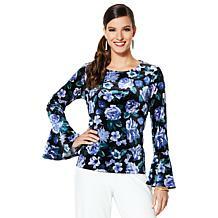 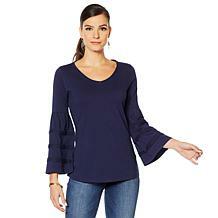 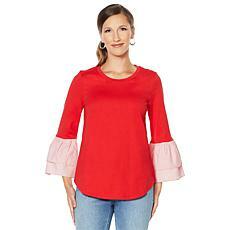 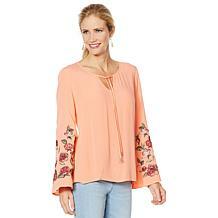 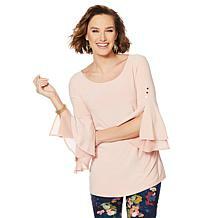 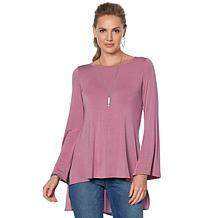 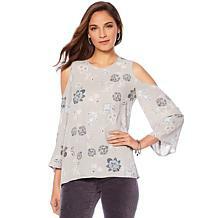 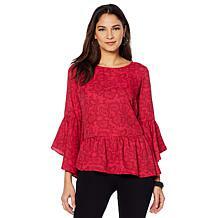 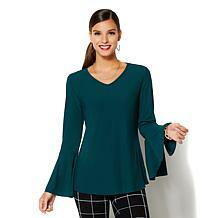 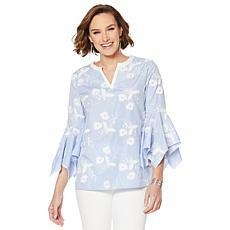 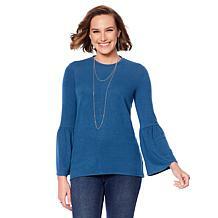 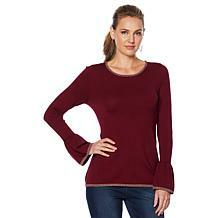 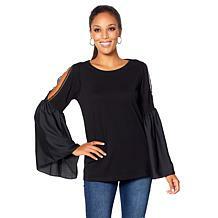 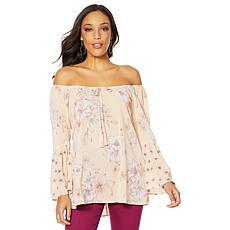 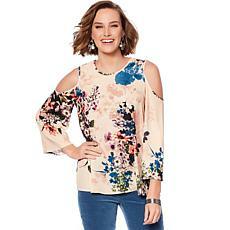 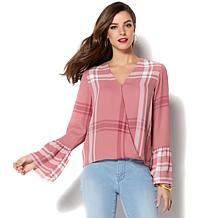 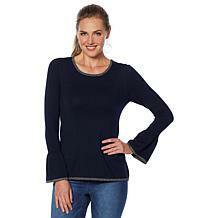 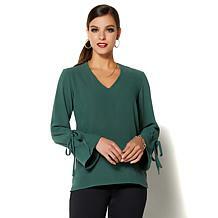 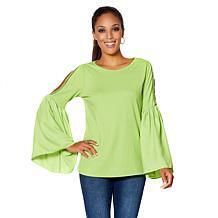 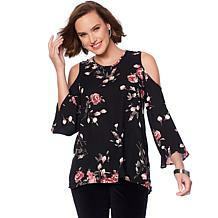 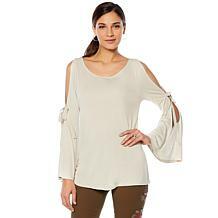 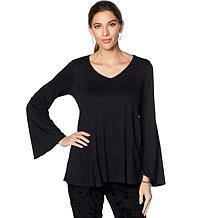 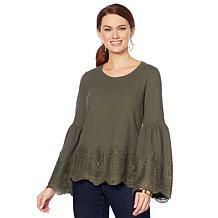 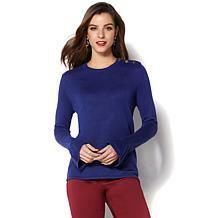 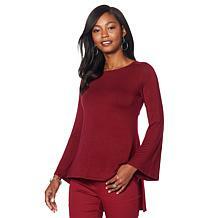 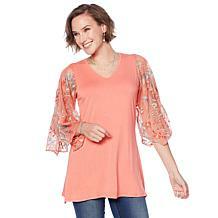 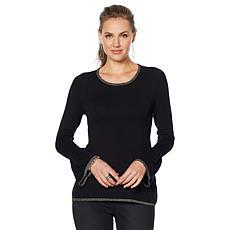 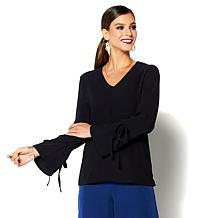 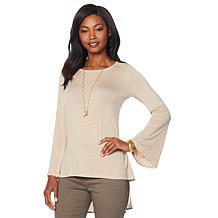 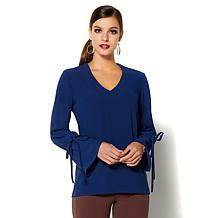 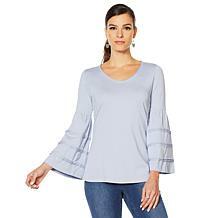 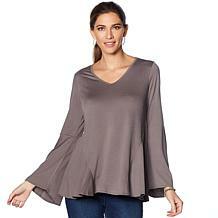 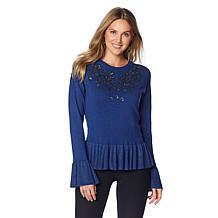 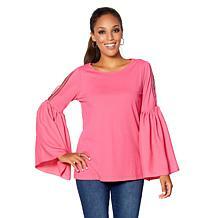 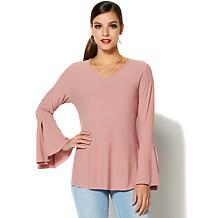 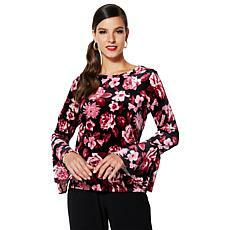 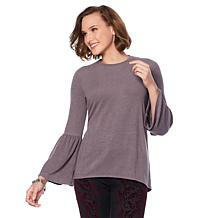 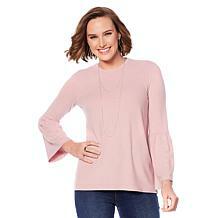 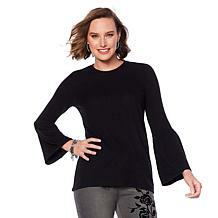 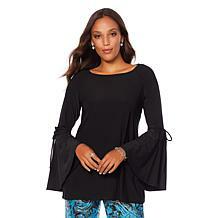 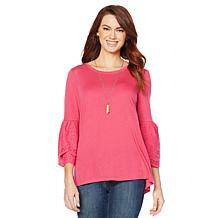 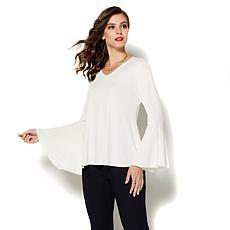 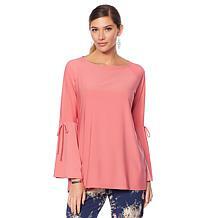 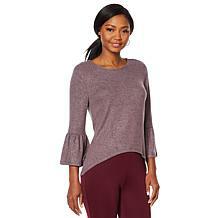 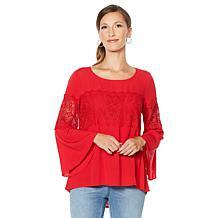 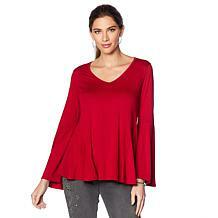 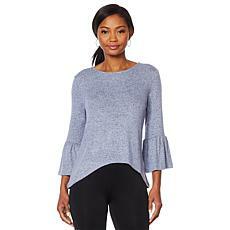 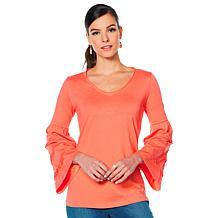 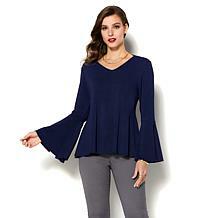 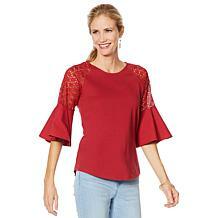 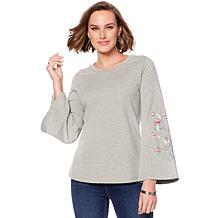 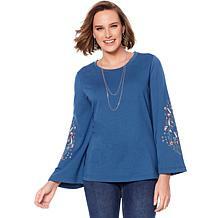 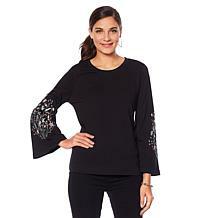 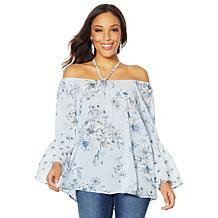 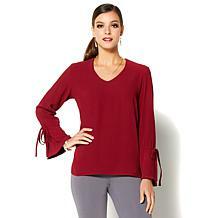 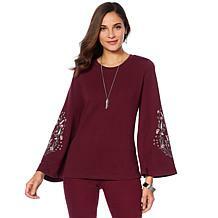 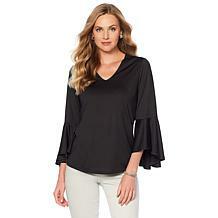 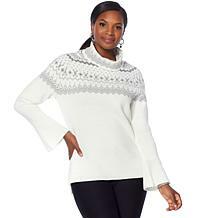 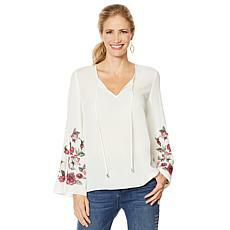 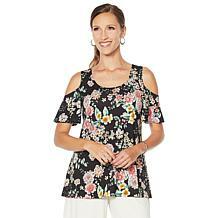 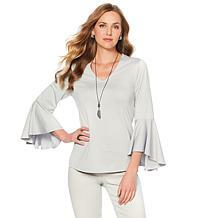 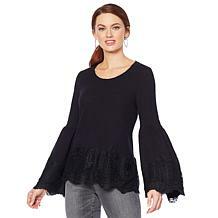 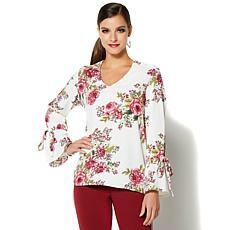 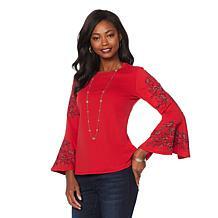 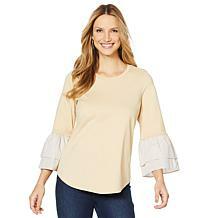 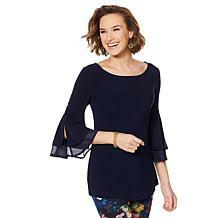 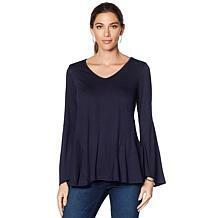 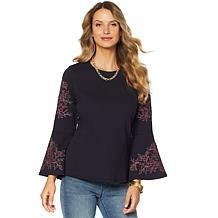 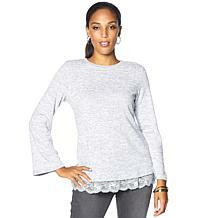 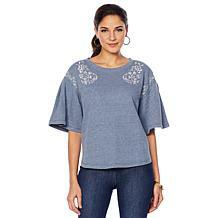 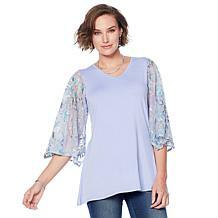 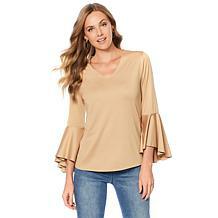 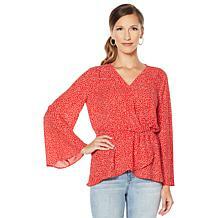 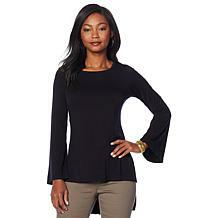 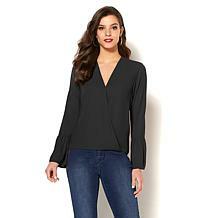 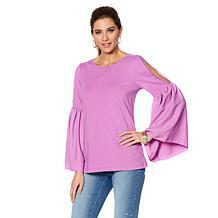 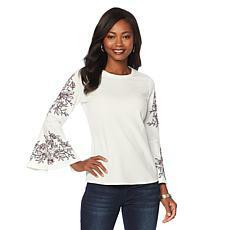 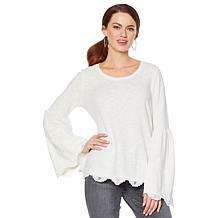 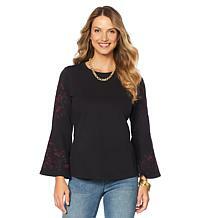 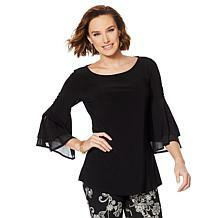 DG2 by Diane Gilman Long Bell Sleeve Crossover Top Refresh your casual style with a romantic bell-sleeve beauty! 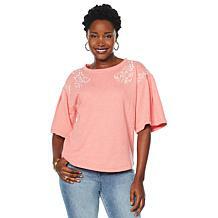 This topper is the perfect companion to your favorite jeans so you can make off-duty dressing look good again. 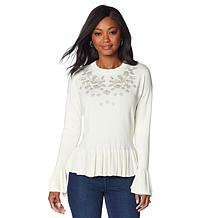 A ring of lace adds a feminine finish to the sweep of this versatile pullover. The tonal trim brings a subtle yet eye-catching detail that elevates even your most casual looks. 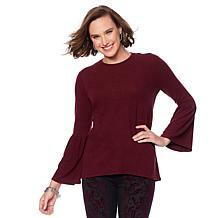 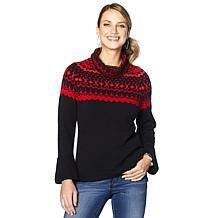 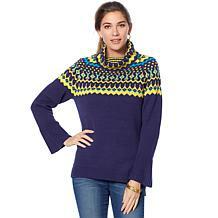 Look as dressy as you want in this jacquard knit pullover. 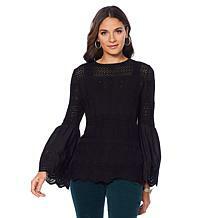 Crochet lace trim highlights the ruched bell sleeves and repeats at the sweep for an elegant finish. 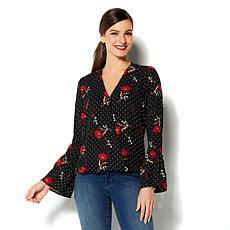 When you put on a print blouse, something magical happens. 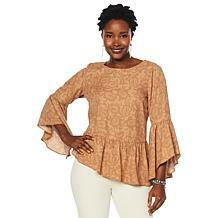 You can't help but feel pretty. 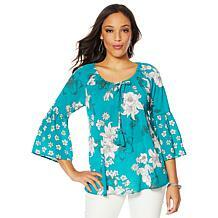 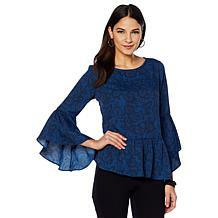 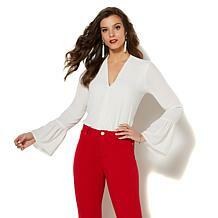 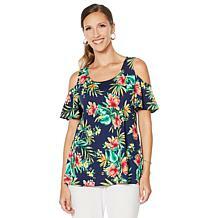 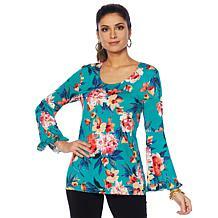 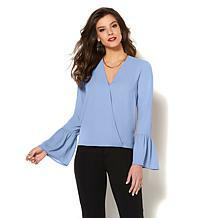 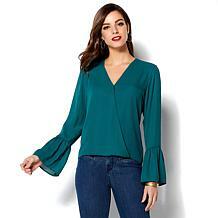 Wear this blouse designed with cutout shoulders and swingy bell sleeves and stand out in a sea of solids. 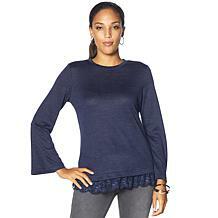 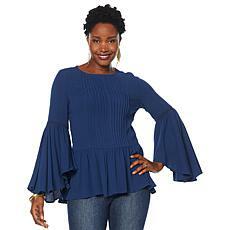 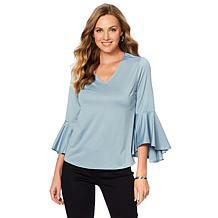 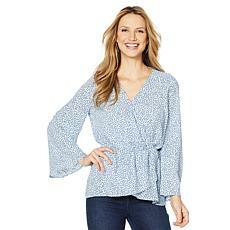 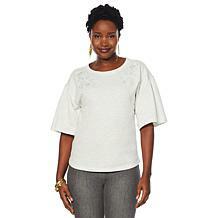 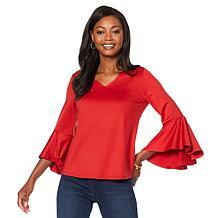 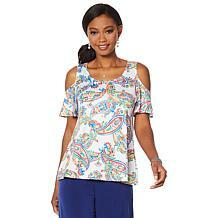 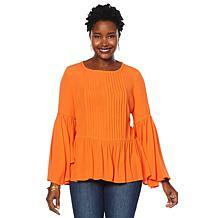 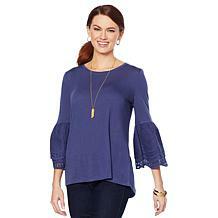 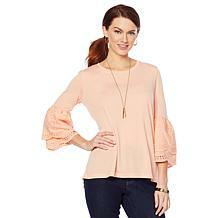 Ruffle bell cuffs transform this cotton top, giving it a flirty silhouette that's right on trend. 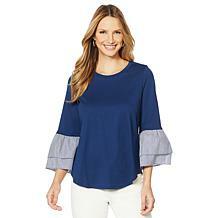 The striped poplin looks fresh and crisp, so wear this top now with jeans and straight through to summer, when you bring out the white pants and capris. 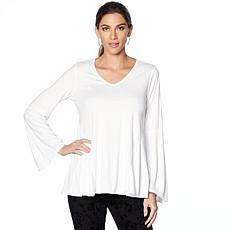 Warm up your wardrobe with a tee that's easy and effortless. 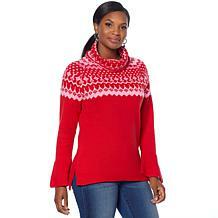 While it's the perfect sentiment for the season, it works any time of year too. 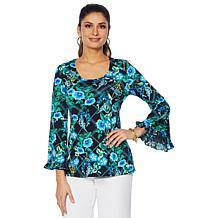 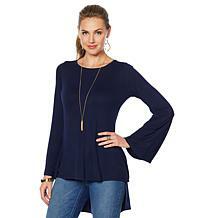 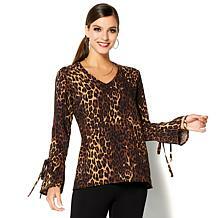 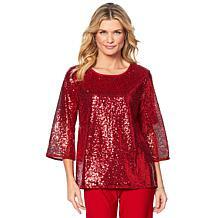 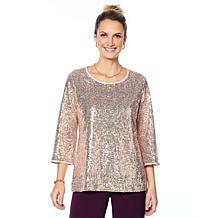 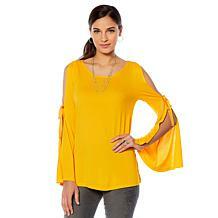 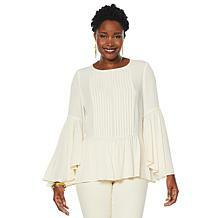 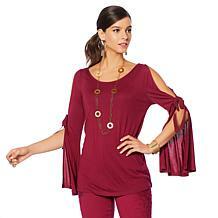 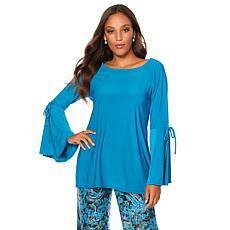 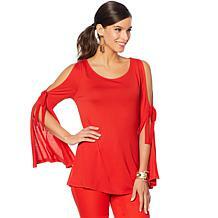 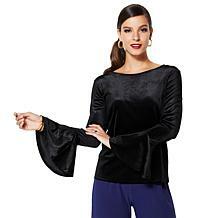 Rhonda Shear 3/4 Bell Sleeve Tunic Capture the essence of cool, and embody chic. 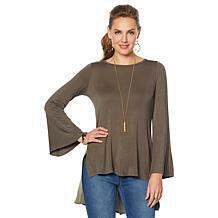 This tunic gives you a perfect topper to your leggings, skirts and jeans.